As the U.S. manufacturing sector advances, the pathways to developing and acquiring talent are also changing to keep pace. Automation and technology has risen in importance, especially in the manufacturing supply chain, and secondary education must reflect current employment needs by offering a wider variety of training options for career choices, including Apprenticeships that take the place of typical school programs for technical-style work. While manufacturers are ideally equipped to define the skills they need to succeed, they can't go it alone. The apprenticeship model, which brings together community colleges and employers, is rapidly taking hold as a viable training approach that can effectively build the manufacturing workforce of the future. 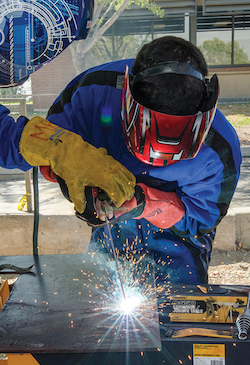 The single largest element that differentiates an Apprenticeship Program from other learning systems is the alignment and connectivity between academic learning and hands-on, practical on-the-job training. CMTA member companies such as IBM, Caterpillar, Alcoa, The Dow Chemical Company, and others have all successfully established apprenticeships in their U.S-based facilities for years. They have reaped the benefits of these programs, namely as a way to develop a highly skilled and qualified workforce that is certified, highly motivated and work-ready. The process of starting an apprenticeship program includes workforce planning, building your business case for an Apprenticeship program, establishing critical public-private partnerships, and marketing your program. While it can be daunting, CMTA is here to help. We can assist with the development of your program and help get you subsidies through our partnerships with existing and emerging federal apprenticeship grant programs and with new money coming online from California legislation that we helped pass in 2018. Your company and your workers will reap tremendous benefits with a successful program. Contact CMTA’s Rob Sanger at 916-498-3334 or rsanger@cmta.net if you’d like to start a new Apprenticeship program or to receive subsidies for your existing registered program. CMTA also has a $1 million multiple employment contract with California’s Employment Training Panel. We can help deliver this money so manufacturers of all sizes can get funding for basic incumbent training programs.